In contrast to the relatively quiet fissure eruptions of flood basalts, at various times more violent eruptions of rhyolitic lava hurled vast quantities of ash and other volcanic material into the air. The resulting rain of volcanic debris covered extensive areas and formed deposits that because of their fragmental character, superficially resemble sedimentary deposits. Rocks resulting from the consolidation of such volcanic deposits are known as pyroclastic rocks; those formed from very fine material, such as ash, are called tuffs. Pyroclastic rocks are not abundant on Isle Royale but do occur sandwiched between some of the flood basalt flows. The bedrock sequence on Isle Royale consists of a thick pile of lava flows and sedimentary rocks that has been tilted toward the southeast. Having already looked briefly at the different varieties of rocks that occur in the pile, we can now examine the rock sequence in more detail and get to know the subtleties of its character and the relative position or succession of its component parts - its stratigraphy. In geology, a formation is an assemblage of rocks that have some character in common, whether of origin or composition. It is thus a way of dividing rocks into manageable units for discussion or for depiction on a geologic map. The rock sequence on Isle Royale has been divided into two formations, one deposited above the other. The lower - and thus older - one has been named the Portage Lake Volcanics and includes all the lava flows and their minor interbedded sedimentary and pyroclastic rocks. The upper formation, the Copper Harbor Conglomerate, contains only sedimentary rocks; it is mostly conglomerate but also includes sandstone. On the Keweenaw Peninsula of Michigan, where these formations also occur and were originally named, other formations can be seen both above and below the Portage Lake Volcanics and Copper Harbor Conglomerate. Some of the other formations undoubtedly also extend to the vicinity of Isle Royale, but they are concealed beneath the waters of Lake Superior. There are probably over 100 individual lava flows in the Portage Lake Volcanics on Isle Royale with a total thickness of over 10,000 feet - quite an impressive pile. And the total thickness of the formation must be greater because although the top of the formation is exposed, the bottom is not, and an unknown number of additional flows undoubtedly lie beneath Lake Superior on the north side of the island. The sedimentary rocks interbedded with the lava flows are exposed only under unusual circumstances because they are more easily eroded than the volcanic rocks and as a result are generally buried beneath surficial materials in depressions between ridges of more resistant volcanic rock. We know from holes drilled during exploration for copper deposits that about 25 sedimentary layers 1 foot thick or more are present in the sequence; however, less than a third of these layers are known from outcrop, and all those are in the upper part of the sequence. In order to construct a geologic map, which shows the geographic distribution of individual rock units and their relationships to each other, some method must be found of distinguishing key rock units from each other; usually, rock composition does the trick. But within a pile of similar lava flows, this is a distinct problem. Fortunately, some of the lava flows in the Portage Lake Volcanics can be distinguished from their neighbors above and below on the basis of their distinctive rock textures. These flows can then be used as divisions or marker units within the sequence of flows and can provide stratigraphic and structural control for depicting the sequence on a geologic map. The interbedded sedimentary rocks would also serve as marker units for mapping if they were exposed more frequently. The amygdaloidal zones at the base and top of flows are less resistant than the massive flow interiors; therefore, the interior parts of the thicker flows are the dominant ridge-forming units. Contacts between flows, on the other hand, are seldom exposed as they are generally concealed beneath alluvial materials or talus in the depressions between ridges. Fortunately for geologic mapping, the distinguishing texture of an individual flow is generally better developed and more readily apparent in the nonamygdaloidal flow interiors, and therefore, that part of a flow most useful for purposes of identification is invariably the most likely part to be exposed. The volcanic rocks on Isle Royale are predominantly ophitic, and except for a few unusual ophites, the nonophitic flows are most conspicuous among their neighbors and make the best horizon markers. The finer grained porphyrites and traps are also generally more resistant to erosion than ophitic flows of similar thickness and thus tend to stand out topographically, making it easier to trace them across the countryside and adding to their usefulness in geologic mapping. There are 12 flows within the Portage Lake Volcanics on Isle Royale that are distinctive enough to be easily separated from the rest of the flows in the pile, and these have been named for ease of reference (fig. 17). Most of these named flows are less than 100 feet thick, but six of them can be traced the length of the island. The named flows include five porphyrites, four traps, and three ophites. Only four of these individual flows are shown on the geologic map in this volume (pl. 2), but all are shown on the larger scale geologic map published separately (Huber, 1973c). For most visitors to Isle Royale, the northeast and southwest ends of the island are the most accessible, although a growing number of visitors are hiking the length of the island and the Greenstone Ridge Trail, which follows Greenstone Ridge, the backbone of the island. At neither end of the island can all the named lava flows or volcanic rock types be readily seen, but enough variety is present to provide interesting geological excursions from Rock Harbor Lodge and Windigo Inn via small boats available at both places. A somewhat less varied assortment of rocks can be seen on short hikes from the lodge areas. Most of the rock types in the Portage Lake Volcanics can be seen in the Rock Harbor - Tobin Harbor area (pl. 1). The main exception is the coarse porphyrite characteristic of the Huginnin Flow (fig. 12D), which can only be seen on the north side of the island. All the volcanic rocks on the chain of islands on the south side of Rock Harbor are ophitic, and excellent exposures can be found on the wave-buffeted south shores of those islands. Ophitic texture is especially well developed on the south side of Raspberry Island where exposures are readily accessible via the Raspberry Island Nature Trail (fig. 13 is from this locality). Ophite can also be seen along the Commodore Kneutson Trail near the Rock Harbor Lodge. 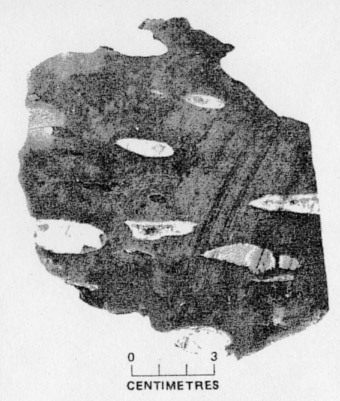 Fine-grained porphyrite can be seen in the Scoville Point Flow at various points on the north shoreline of Rock Harbor, as at Threemile Campground, on Scoville Point, and on the south sides of Edwards and North Government Islands. Its speckled appearance is quite distinctive (fig. 12B). Rock with a somewhat similar texture (fig. 12C) can be seen in the Tobin Harbor Flow at various points along the north shoreline of Tobin Harbor, as near the dock for the Lookout Louise Trail, on several small islands in Tobin Harbor, and on the south side of Porter Island. The trail to Mount Franklin also surmounts a bold outcrop of the Tobin Harbor Flow shortly after crossing Tobin Creek. Fine-grained trap of the Edwards Island Flow can best be seen on the small promontory just north of Scoville Point, on Split Island, and on the north sides of Edwards and North Government Islands. Trap of the Long Island Flow can be seen on several small islands opposite the dock for the Lookout Louise Trail and on Long and Third Islands. The Edwards Island Flow and to a lesser extent the Long Island Flow have an important secondary attribute that helps in their field recognition; except for the upper part of the Greenstone Flow, they are the only flows in the volcanic sequence that commonly exhibit well-developed columnar jointing (fig. 18). Columnar joints are cracks that divide a lava flow into long vertical columns ideally tending toward a hexagonal cross section. They are formed during cooling of the flow under certain specific conditions. Rapid and uniform cooling rates tend to promote the development of columnar joints, but the degree of homogeneity of the solidifying rock is probably more important. It can be shown mathematically that the surface of a homogeneous medium should be divided by a crack system defining regular hexagons when it is subjected to uniform tension because a hexagonal system provides the greatest stress relief with the fewest cracks. Regular hexagons are rare, however, because cooling stresses in rocks are never completely uniform and the columns are generally bounded by curved cracks forming irregular-shaped polygons with variable numbers of sides. "Ideal" cooling conditions are never reached at the surface of a flow. However, as a progressive zone of cooling, solidification, and cracking proceeds from the surface of a flow into its interior, a point may be reached where the shrinkage forces may be uniform enough for earlier irregular jointing to give way to the formation of columnar joints. The importance of the homogeneity of' the cooling rock explains why in the Portage Lake Volcanics well-developed columnar jointing is restricted to the very fine grained traps and has only a very slight tendency to form in the coarser grained porphyritic and ophitic rocks. Columnar jointing can be seen in the Edwards Island Flow at all the localities mentioned previously. Other accessible areas where columnar jointing can be observed are where the trail from Rock Harbor to Mount Franklin crosses the flow and on the south slope of Ransom Hill just west of the trail from Daisy Farm Campground to Mount Ojibway. The Greenstone Flow is the thickest flow on the island and holds up the most prominent ridge running the length of the island, Greenstone Ridge. The Greenstone Ridge Trail, which follows the ridge for nearly its full length, provides access to numerous scattered outcrops, but only at the far northeast end of the island near Blake Point is a reasonably complete cross section of the flow exposed. 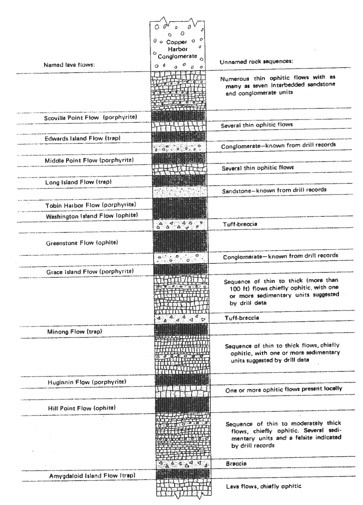 There the flow can be seen to consist of four divisions with approximate thicknesses as indicated: a lower ophitic zone (100 ft), a central pegmatitic zone (75 ft), an upper ophitic zone (175 ft), and an uppermost columnar-jointed trap (50 ft), for a total thickness of about 400 feet. The Greenstone Flow attains its greatest thickness in the central part of Isle Royale, where it is estimated to be nearly 800 feet thick. The lower ophitic zone, which makes up the cliffs of the Palisades on the north side of Blake Point, is of particular interest as it is matched in coarseness only by the ophite of the Hill Point Flow; each has augite crystals as much as 2 centimetres in diameter. The pegmatite is best seen in the vicinity of the lighthouse on Blake Point. The columnar jointed trap that forms the uppermost part of the Greenstone Flow is exposed on the string of small islands south of Merritt Lane, on Red Rock Point, and at a few additional isolated localities on the main island. An excursion to Blake Point is also a botanical experience, as a rather unusual shrub fills a small ravine just west of the lighthouse - devilsclub. The entire plant, including its giant leaves, is profusely armed with sharp spines, and anyone who ventures to walk through a thick stand of these would appreciate the plant's specific name -- Oplopanax horridum (fig. 19). It presence on Isle Royale is truly remarkable, for it appears nowhere else in the United States east of the Rocky Mountains; at Isle Royale it is found only near Blake Point, on Passage Island, and on a few of the small islands in the Rock Harbor area. Pyroclastic and sedimentary rocks are exposed in only a few localities in the Rock Harbor - Tobin Harbor area. Pyroclastic rock can be seen on the north shore of Tobin Harbor opposite Newman Island and on Porter Island above (southeast of) the columnar jointed upper part of the Greenstone Flow. 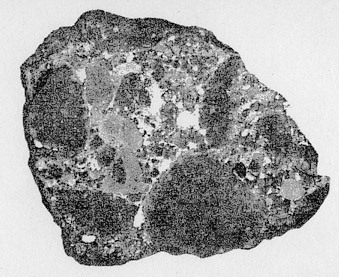 The rock is a tuff-breccia, composed of angular fragments of volcanic rock cemented together by ash (fig. 20). The ash was in a hot and partly plastic state when deposited and was then fused into a coherent mass upon cooling. An extensive wave-swept outcrop of conglomerate is exposed at the southwest end of Moth Island, and a few other less accessible outcrops are scattered along the rest of the chain of islands south of Rock Harbor (fig. 21). Volcanic rocks of many varieties can be identified as pebbles in the conglomerate. Many of them are of rhyolite or other types different from those that form the bulk of the Portage Lake volcanic sequence and must have been derived elsewhere. The orientation of the beds on the Keweenaw Peninsula is a mirror image of' that on Isle Royale. The bedrock sequence, similar to that on Isle Royale, generally dips northwestward toward the axis of the Lake Superior basin. 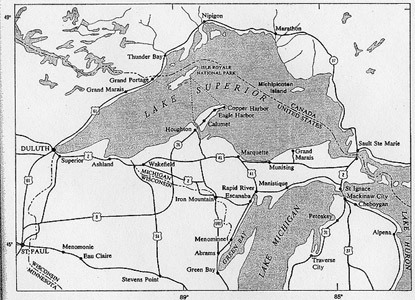 Recognition of these similarities permitted C. T. Jackson to state as early as 1849 that "this island has the same geological character as Keweenaw Point, and is of the same geological age." 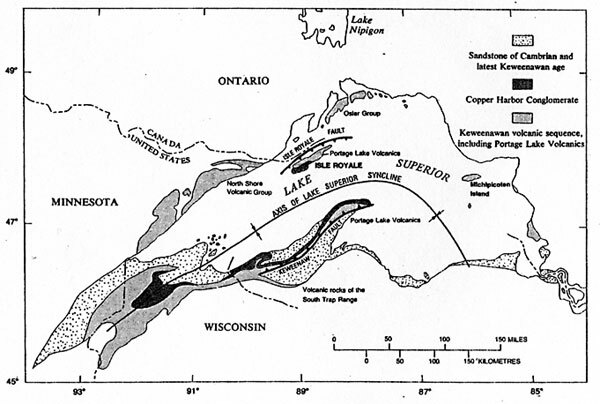 He and his colleagues, J. W. Foster and J. D. Whitney, furthermore considered the rock sequences in the two areas to be connected beneath Lake Superior and thus interpreted the lake as occupying a structural basin, a syncline, as well as a topographic depression (fig. 38). The later work of A. C. Lane not only reinforced this interpretation but also demonstrated that some individual lava flows or groups of flows, as well as some sedimentary rock units, on Isle Royale were the same as those on the Keweenaw Peninsula (fig. 39). The continuity of the Greenstone Flow across the Lake Superior basin is most convincing, and its name is used in both localities; specific correlation of other flows is less certain, and separate names are applied to them on opposite sides of the lake. The Portage Lake Volcanics on Isle Royale and on the Keweenaw Peninsula represent only the upper part of the total Keweenawan volcanic sequence in the Lake Superior region. The lower part of the sequence is exposed in the so-called South Trap Range of westernmost Michigan and along the north shore of Lake Superior in Minnesota and Ontario. Different formation names are given to these rocks in different areas (fig. 39). The total volcanic sequence reflects a long period of volcanic activity with a complex history. Erosional debris derived from the lower part of the volcanic sequence occurs in the sedimentary rocks interbedded with the lava flows of the Portage Lake Volcanics. The interpretation is that the lower part of the sequence was being eroded at the margins of a basin while the later flows were still being erupted into the central part of the basin. The geologic story of Isle Royale as presented up to this point has been largely a description of the geology as we see it now. But how did it get this way? And when? The search for answers to these questions involves considerable interpretation of geologic observations made on Isle Royale and in the Lake Superior region, together with numerous deductions based upon our accumulated geologic knowledge. Some parts of the geologic history can be deciphered in considerable detail, and other parts only incompletely because the geologic data are very spotty. The first step toward the answers is to develop a time framework within which to reconstruct events in the geologic past. A relative time scale, useful throughout the world, has been developed by dividing the last approximately 570 million years of geologic time into periods. The periods, which began with the Cambrian and end with the Quaternary, are recognized largely from the fossil record (fig. 40). Rocks of the Cambrian Period contain the earliest evidence of complex forms of life, which slowly evolved through the subsequent periods into the life of the modern world. 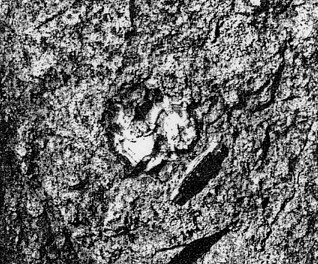 The presence of distinctive fossils in various periods permits the correlation of rocks of similar age. However, the near absence of fossils in Precambrian rocks - those older than 570 million years - severely limits the use of fossils for the relative dating of the Precambrian rocks, rocks which cover more than 80 percent of geologic time. The rocks on Isle Royale are unfossiliferous and of Precambrian age, and it is with this poorly classified segment of geologic time that we are mostly concerned. Fortunately, a means for measuring geologic time without fossils has been developed from the long-known natural process of radioactive decay of certain elements. From such radiometric age determinations, many rocks can now be assigned ages in years, which for Precambrian rocks, in the near absence of fossils, are virtually the only means for long-range correlations. The uppermost, or youngest, Precambrian rocks in the Lake Superior region consist of a thick sequence of volcanic and sedimentary rocks. This sequence has been named the Keweenawan Supergroup because many of the formations that make it up were first described on the Keweenaw Peninsula and adjacent parts of Michigan and Wisconsin. The period of time during which the Keweenawan rocks were deposited can be referred to informally as Keweenawan time, recognizing that the term has usefulness only in the Lake Superior region where the Keweenawan rocks themselves occur. The Keweenawan Supergroup has been informally divided into lower, middle, and upper parts; formations exposed on Isle Royale, the Portage Lake Volcanics and the Copper Harbor Conglomerate, are assigned to the middle Keweenawan (fig. 41). We do not have sufficient data to determine the bounds of Keweenawan time, but radiometric age determinations indicate ages in the general range of 1,120-1,140 million years ago for the Keweenawan volcanic rocks. It is from this point in the enormously distant past that we begin to unravel the geologic history of Isle Royale. Rocks of Keweenawan age, as old as they are, rest upon still older Precambrian rocks that are strikingly different. The older, or basement, rocks are of many varieties, ranging from granite and other intrusive igneous rocks to volcanic and sedimentary rocks, and cover a wide range in age. They usually are both more highly metamorphosed, or altered from their original state, and more strongly deformed than rocks of the Keweenawan sequence. Basement rocks are not exposed on Isle Royale, but they are sufficiently well exposed in areas both north and south of Lake Superior for their nature to be studied and their relationship to the overlying Keweenawan sequence to be determined. The history of the pre-Keweenawan rocks is extremely complex, as might be expected from the wide range in rocks and age; however, prior to the time the Keweenawan rocks were deposited, much of what is now the Lake Superior region had been reduced to an area of fairly low relief, and shallow seas covered large parts of it. A thick sequence of marine sedimentary and volcanic rocks was then formed in those seas. 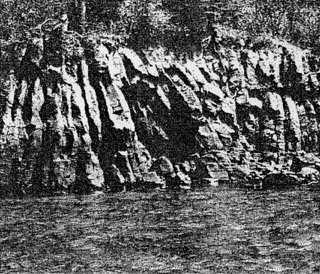 In addition to impure sandstone and shale, chemically precipitated sediments were deposited, including dolomite and the iron-rich rocks that were later to make the Lake Superior district world famous as a producer of iron ore. 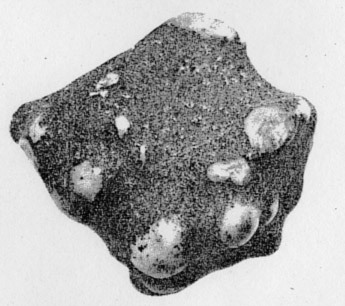 The material forming the pre-Keweenawan volcanic rocks was erupted under water, where quick quenching of the lava caused it to congeal in irregular-shaped globular or ellipsoidal masses that accumulated one upon the other at the bottom of the sea (fig. 42). These volcanic rocks are thus quite different from the uniformly layered widespread sequence of Keweenawan flood basalts. Toward the close of pre-Keweenawan time, the rocks present were folded, deformed, and eroded, quite drastically in some areas and only slightly in others, and so the material forming the overlying Keweenawan volcanic and sedimentary rocks was laid down on the edges of the older beds in some localities. The lowermost Keweenawan strata, which are not present on Isle Royale, consist of a relatively thin sequence of sedimentary rocks, chiefly conglomerate and sandstone, that lie on the preKeweenawan rocks. They have been interpreted as shallow-water, near-shore deposits and are exposed in only a few localities along the perimeter of the area of Keweenawan outcrops around the margins of the Lake Superior basin. The lowermost few of the Keweenawan lava flows above these sedimentary rocks contain ellipsoidal structures typical of those formed when lava is erupted into a body of water. Such structures are found only near the base of the lava sequence, however, and we conclude that the first few of the flood basalt flows were erupted into a shallow body of water, which was soon filled or disappeared for one reason or another, and that all later flows were on virtually dry land. Furthermore, as mentioned earlier, the sedimentary rocks interbedded with the lava flows show characteristics typical of those formed in streams rather than in lakes or oceans. The source of the lavas appears to have been along the axis of an arc-shaped trough or system of fissures generally following the center of present-day Lake Superior. The system was actually much more extensive, however, extending southwest at least as far as Kansas and southeast into the southern peninsula of Michigan, a total distance of over 1,000 miles. Great volumes of lava were erupted from fissures near the axis of the trough and spread laterally and rapidly toward both margins of the trough, finally ponding and cooling in place to form vast sheets covering thousands of square miles. The Portage Lake Volcanics, as exposed on the Keweenaw Peninsula and Isle Royale, represent roughly the upper half of this volcanic pile (fig. 41). The material forming the sedimentary rocks that are interbedded with the lava flows of the Portage Lake Volcanics and that are in the Copper Harbor Conglomerate and other Keweenawan formations above the lava sequence was transported by streams into the trough or basin from highlands around its margins. This evidence for inward flow of streams, contrasted with evidence that the lavas flowed toward the margins of the basin, shows that there were, at times, reversals of the prevailing slope over large areas and leads to the concept of a basin subsiding as it was being filled (fig. 43). The surfaces of the lava flows were horizontal or sloped gently toward the margins of the basin as long as filling by lava kept pace with downwarping. When extrusion of the lava was interrupted, however, continued downwarping produced inward slopes that permitted sedimentary debris to be swept into the basin. Finally, with the gradual demise of volcanic activity, continued subsidence permitted the accumulation of the Copper Harbor Conglomerate and younger Keweenawan deposits to form a thick sedimentary sequence above the volcanic rocks in the basin. Sandstone of latest Keweenawan or earliest Cambrian age is exposed along much of the shore of the southeastern part of Lake Superior and extends westward to the Keweenaw Peninsula. The basin may have been largely filled by this sandstone, together with similar sandstone exposed in the southwestern part of the basin (fig. 39). The gross synclinal form of the Keweenawan basin resulted from subsidence coincident with filling of the basin rather than later folding by squeezing. However, Keweenawan strata near the margins of the basin, as on the Keweenaw Peninsula and Isle Royale, were subsequently steepened by upward movement on major faults, the Keweenaw fault and the Isle Royale fault, thus accentuating the synclinal structure (fig. 38). Many interesting minerals occur on Isle Royale in addition to the basic rock-forming minerals that make up the bulk of the lava flows and other rocks on the island. Among these are the native copper that played such an important part in the early explorations of the island and chlorastrolite, the official state gem of Michigan. "These minerals as a group are known as secondary minerals, ones introduced into the rocks after the rocks themselves were formed. They chiefly fill holes in the volcanic rocks and the conglomerates or form veins filling fractures. Some of these minerals, especially those occurring as amygdules in the volcanic rocks, are quite attractive when polished and long have been sought by collectors, although collection has been restricted since Isle Royale became a national park. Fortunately for the collector, these minerals, except for chlorastrolite, are equally or more abundant on the Keweenaw Peninsula or elsewhere in the Lake Superior region. Considerable evidence obtained during mining activities on the Keweenaw Peninsula indicate that the copper and most other secondary minerals were deposited from solutions that percolated upward through the rocks. We can only speculate upon the ultimate source of the copper and other elements in the mineralizing solutions, but one of the more generally accepted theories is that those elements were "sweated" out of the lower part of the pile of volcanic rocks after those rocks were warped downward in the Lake Superior syncline, into a region of higher temperature and pressure. The elements then migrated upward and were deposited as minerals in open spaces higher in the rock sequence. If the source of the mineralizing solutions was indeed the deeper part of the volcanic pile, then the source also would have been closer to the Keweenaw Peninsula, for the axis, or deepest part of the Lake Superior syncline, is closer to the Keweenaw Peninsula than to Isle Royale. This asymmetry of the syncline may have been one of the more important factors in producing economically valuable deposits of copper on the peninsula but not on Isle Royale. Among the many secondary minerals on Isle Royale, those occurring most often are barite, calcite, chlorite, copper, datolite, epidote, laumontite, natrolite, prehnite, chlorastrolite (pumpellyite), quartz (including agate), and thomsonite. Only a few of special interest on Isle Royale are described further in this report. Information on the others can be obtained from many sources, including the booklet "Rocks and Minerals of Michigan" (Poindexter and others, 1965). NATIVE COPPER - WIDESPREAD BUT NOT ABUNDANT Copper, like most other metals, most commonly occurs in nature bound up with other elements into minerals such as chalcocite(Cu2S), chalcopyrite (CuFeS2), and cuprite (Cu2O), and such minerals form the bulk of copper ores. Of all the metals that do occur in the native or metallic state, copper is by far the most common; however, major concentrations of native copper are rare, and so it is noteworthy that the most important deposits known in the world are those of the Keweenaw Peninsula. Economically valuable concentrations or deposits of native copper on the peninsula can be divided into two broad groups - lode deposits and fissure deposits. The lode deposits comprise mineralized conglomerate beds and the vesicular tops of lava flows; in each case the primary porosity of the rock or presence and continuity of open spaces was a factor in determining where the ore would be deposited. The fissure deposits are along fracture zones that generally cut across the beds. Some of the fissure deposits contained great masses of metallic copper as much as hundreds of tons in weight. Extensive Indian mining pits on the fissures later led prospectors to most of the known deposits of this type. However, such deposits, rich as they were, have been much less important than the lower grade but vastly larger lode deposits, which have produced about 98 percent of the total copper mined in the Native Copper district, about 5,400,000 tons. Native copper is widely distributed on Isle Royale, but mineralization was apparently too weak to develop large lode deposits. Except for the Island mine, which was on a conglomerate lode, most of the prospects and short-lived mines on the island were opened on small fissure deposits. In the fissure occurrences, such as at the Minong, Siskiwit, and most other mines and prospects, native copper occurs in nodules and irregular masses in highly altered rock in fracture zones a few inches to many feet wide. 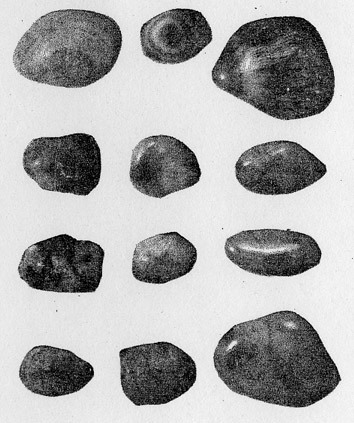 Several large masses more than a ton in weight were found at the Minong mine (fig. 69); these were rare and most pieces mined were probably similar to that in figure 70, or smaller. Although approximately 250 tons of copper were produced from the Minong mine, the copper was too sparse and widely distributed to be mined profitably. At the Island mine, near the west end of Siskiwit Bay, native copper occurs in the matrix of a conglomerate, the only known occurrence of this type on Isle Royale. The specimen illustrated (fig. 71), however, is much richer in copper than average for the mine, and this mine too was a financial failure. In other places in the park, most notably on the chain of islands south of Rock Harbor, veins of quartz, prehnite, and calcite contain scattered grains of copper. Native copper also occurs in amygdules in lava flows, especially in prehnite amygdules. 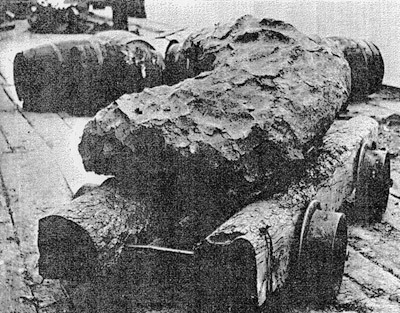 Rakestraw (1966) has described the historic mining ventures on Isle Royale and what the visitor can see at some of the abandoned mine sites. Isle Royale has long been famous as the home of chlorastrolite, known informally in rock-collecting and lapidary circles as "Isle Royale greenstone." This usage of "greenstone" should not be confused with the use of the same term for a volcanic rock with a greenish hue, such as makes up Greenstone Ridge on the island. In 1972 the governor of Michigan signed a bill designating chlorastrolite as the official state gem. Chlorastrolite, meaning "green star stone," occurs as amygdules or cavity fillings in certain of the lava flows on Isle Royale. When weathered out of the lava flows, it can be found on some of the island beaches as pea-sized pebbles, generally greenish in color. When polished, either by wave action on the beaches or artificially, the "greenstones" generally exhibit a distinctive and attractive mosaic or segmented pattern, sometimes referred to as "turtleback" (fig. 72). The polished stones also commonly are chatoyant - the property of having a luster resembling the changing luster of the eye of a cat. Chatoyancy is probably best known in the gemstone called tiger eye and is a property of translucent material that contains fibrous structures capable of' scattering light. The grouping together of bundles of such fibers produces the mosaic pattern of the "greenstones." Chlorastrolite was first discovered on Isle Royale and named and described by C. T. Jackson and J. D. Whitney in 1847. Long afterward it was found to be the same material as another mineral, pumpellyite, first described from the Keweenaw Peninsula in 1925 and named for Raphael Pumpelly, a pioneer student of the minerals of the Keweenawan copper deposits. The material from the peninsula was described in much greater detail than that from the island, and the name "pumpellyite" became deeply entrenched in the world mineralogical literature long before it was realized that the material from both areas was mineralogically the same. Consequently, pumpellyite has been adopted as the only valid name for the mineral species, although chlorastrolite is still useful as a term to designate the variety with the peculiar crystal habit of the Isle Royale "greenstone." Pumpellyite is common in many parts of the world, but the chlorastrolite variety is apparently rare outside of Isle Royale. Prehnite is an abundant secondary mineral in some lava flows on Isle Royale and elsewhere in the Lake Superior region. It occurs as amygdule fillings, crosscutting veins, and as a replacement of earlier minerals or rock. Most of the prehnite has a characteristic pale-green to white color, but that in amygdules is commonly light to dark pink or variously mottled in pink and green. The pink prehnite superficially resembles thomsonite, with which it has commonly been confused: most of the so-called thomsonite from Isle Royale is actually pink prehnite, including material from Thomsonite Beach on the north side of the island. The prehnite does not develop the spectacular patterns and color variations present in gem-quality thomsonite, which explains why "Isle Royale thomsonite" has always been considered to be of inferior quality. Nevertheless, the prehnite amygdules polish nicely and are attractive in themselves. The pink prehnite amygdules, which most commonly range in size from 1/2 to 1 centimeter, are more resistant to erosion than the volcanic rock matrix within which they have formed. 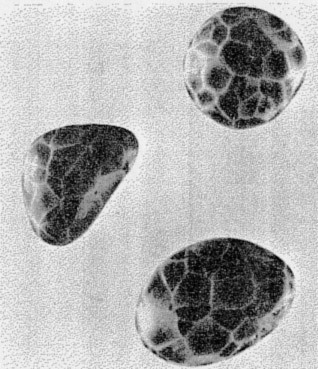 As a result, beach pebbles containing them often have a knobby appearance, the amygdules projecting above the general surface of the matrix (fig. 73). Where the prehnite amygdules weather completely free from the matrix, they may make up a fair percentage of the fine gravel on beaches near the prehnite-bearing outcrops. 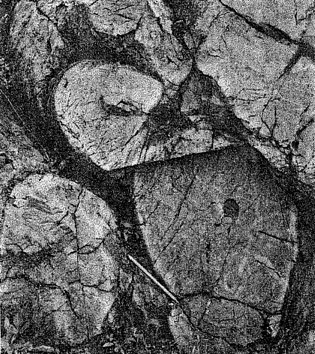 The amygdules in figure 74 are typical and illustrate the radiating fibrous habit, with the occasional development of "eyes," that has probably been a factor in their confusion with thomsonite. The pink color of the prehnite is due to internal reflections from finely disseminated native copper inclusions, and the color intensity is related to the distribution, abundance, and grain size of the inclusions. Perhaps the best known gemstones of the Lake Superior region are agates. Although they are most plentiful near where they weather from the enclosing rocks, glacial transport has caused them to be widely distributed, and there are few pebble beaches where one cannot be found. Agate is a subvariety of chalcedony (fibrous quartz) with a distinct banding in which successive layers differ in color and in degree of translucency. It most commonly originates as a cavity filling in volcanic rocks either as amygdules in volcanic flows or as irregular-shaped masses in volcanic tuffs; both types occur in the Lake Superior region, including Isle Royale. One of the most striking examples of an agate-bearing lava flow in the park is the Amygdaloid Island Flow. This flow, exposed only on Amygdaloid Island, has rather abundant rounded or almond-shaped agates with a characteristic flesh-pink color and commonly massive quartz or vuggy centers (fig. 75). Agates from an individual flow tend to be somewhat similar in appearance; for example, those from the Amygdaloid Island Flow are pinkish, whereas those from the Long Island Flow tend to be bluish. In general, agates from the rocks on Isle Royale are paler and have less color contrast between color bands than those found in some other parts of the Lake Superior region. The volcanic tuff that overlies the Greenstone Flow also contains numerous agates with a pink or red cast (fig. 76). Unlike the ovoid agates typically occurring in the lava flows, these agates tend to have very irregular shapes similar to the so-called thunder-egg agates occurring in welded tuffs of the Columbia River Plateau in the northwestern United States, and they probably had a similar origin. The welded tuffs formed from volcanic ash that fell in a hot plastic condition that permitted it to be fused or welded into a generally cohesive mass. The agates themselves are interpreted as chalcedony deposited in cavities formed by pockets of gases accumulating during cooling, shrinkage, and partial crystallization of the tuff. Because of their hardness, agates are more resistant to erosion than the enclosing rock and tend to become concentrated in gravel and other surficial deposits both ancient and modern. Thus agates are present in the conglomerates interbedded with the lava flows on the island and in the Copper Harbor Conglomerate, as well as in the modern surficial deposits. Most of the agates on beaches near conglomerate outcrops have, therefore, gone through two cycles of weathering and release from their host rock - first from the volcanic rock in which they originated and then from the conglomerate in which they were subsequently incorporated. In addition to beach agates derived from nearby bedrock, some have been winnowed from glacial till by wave action and may have been transported a long distance from their original source; they commonly are quite different in some way from the majority of the agates on a given beach. As we pick up an agate from the beach and admire its color and pattern, we can reflect upon the enormous amount of change that has taken place since it originated as an amygdule in a lava flow a billion or so years ago. The time from the volcanic eruptions to the coming of the glacier that may have brought that agate to its resting place, however, was itself enormous, even in the geologic sense - nearly one-fourth the age of the earth itself. And although things are relatively quiet on Isle Royale at the present time, geologically speaking, changes will continue to take place slowly but certainly. Storm waves will continue to batter the shoreline cliffs, wearing them back. Winter frost will loosen rock fragments on the hillsides for the summer rains to wash downslope. The streams will deposit silt in the landlocked lakes until they are filled and cease to exist as bodies of water. These continuing changes take place so slowly that they are nearly imperceptible to us. They are quite different from the cataclysmic eruption of a volcano or the steady advance and envelopment of an ice sheet. But perhaps this is just a quiet moment in the continuing geologic history of Isle Royale. While renewed volcanic activity is unlikely, many scientists believe that we are now in an interglacial epoch and that massive ice sheets will again form on the Canadian Shield to move inevitably southward, again modifying the earth's surface as they grind their way over it. Perhaps the future glacier might even bring some new agates to the beach for another visitor to admire.